Ultraman BUL Aqua "Ultraman R/B", S.H.Figuarts by Bandai Hobby. - Ultraman Bull is transformed with [Ginga Crystal] with [Water] attribute. - The coloration of the head consisting of the characteristic metallic blue is reproduced by imagining the inside of the play. - Large sword [Rub Slugger Buru] is included. - As a first privilege, a special pedestal plate with water and earth elements image attached. [Ultraman Rosso Flame], [Tue], [Wind]. 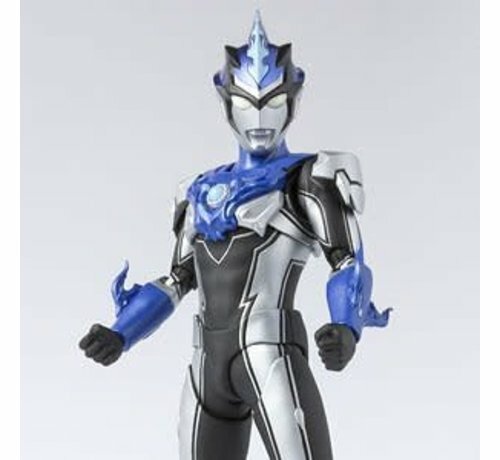 [Ultraman Blue Aqua] comes with [Wednesday], [Sat] 's first bonus plate.